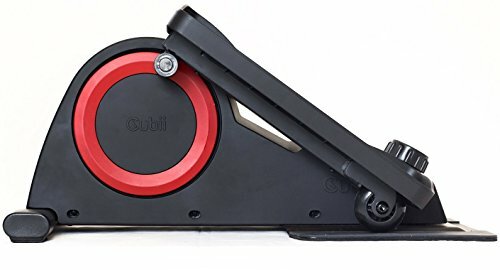 Our quest for the best workplace fitness devices and gadgets would never be complete without a review of Cubii, the latest under-desk elliptical that is being touted by one and all as the best one in the market. It has tons of positive customer ratings from the workplace-fitness community. Some of the reviews are pretty rave. The sales have skyrocketed ever since they started to ship out their first batch of machines in late 2015. What makes the Cubii command a price tag that is almost double that of the Jfit Sitting and Standing under-desk elliptical and still outsell most other models? Let’s find out. Here’s EllipticalHub’s review of the Cubii. The Cubii is a looker. Kudos to the manufacturers for paying some attention to the aesthetics, even though the machine will remain hidden from public view. This is a refreshing change from the clunky machines that are sold commonly on late night infomercials. You can take your pick from three color choices, a dual tone red and black, black and silver or a wooden finish. All three look equally good with a matte finish plastic housing. It stands just 9.8 inches tall and is 17.6 inches in depth which makes it one of the most compact under-desk elliptical machines ever. This low profile clubbed with the pedaling motion prevents the knee from hitting the desk and eliminates the need for a height-adjustable desk even for taller users. Beneath the plastic housing is an all-metal frame construction that makes this stable and durable. The Cubii weighs 28 pounds. So, carrying it around will be an exercise in itself. There is a carrying handle that is positioned intuitively between the two pedals that let you move it easily provided you can carry 28 pounds without breaking a sweat. There is a micro-USB port on the back side of the Cubii and a LED light on the front part of the housing that indicates the battery status. There is another blue LED light that detects the pairing status of the unit with a smartphone. The market for under-desk elliptical machines is dominated by mechanical units that do not require electricity and have inbuilt LCD panels. The Cubii outscores the rest by being the only machine that connects to its proprietary mobile application via Bluetooth and lets you customize your workouts to the T.
The Cubii takes approximately 6 hours to get fully charged. Once done, you can download the free Cubii app from Playstore, register to enter your details and pedal on the machine for 4-5 minutes to begin pairing with your mobile phone. The application has a very user-friendly interface and lets you change resistance levels on the machine, keep track of your progress with a calendar, count the calories burnt, distance traveled, duration worked out for and the number of strides you made. Even if the machine loses connection with the phone, you can continue to use it. When the connection is established again, the statistics will be updated automatically. The application is also compatible with your FitBit band if you use it, allow you to make workout friends, share your progress and also create new fitness goals. If you ever feel demotivated, the community can help you get back on track. We have used some under-desk elliptical machines that create a ruckus after a few weeks of usage. The Cubii creates a very low hum that is barely noticeable. If anything, it can be compared with the white noise that a fan produces. Overall, it is one of the most silent workplace fitness devices we have ever seen. Despite trying incredibly hard, we could not find any significant nits to pick with the Cubii. 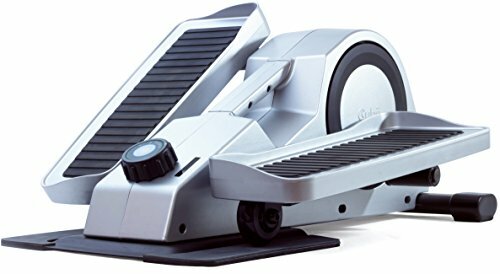 It seems to be one of the most flawlessly designed under-desk elliptical machines that offer enough reasons to look beyond the steep price tag. Verdict: The Cubii brings versatility to one of the most popular fitness devices in current times by linking it with a smartphone. It makes your workout routines more personalized and interactive. Also, its ergonomics and charming design make it a worthy purchase for anyone who’s interested in burning a few calories while clacking away on the keyboard.